If you're looking for some design inspiration to reinvent or re-energize your residential space, commercial shops and restaurants can offer a plethora of ideas. With some careful observation of a space you really love being in, you're basically getting creme de la creme design service for FREE. 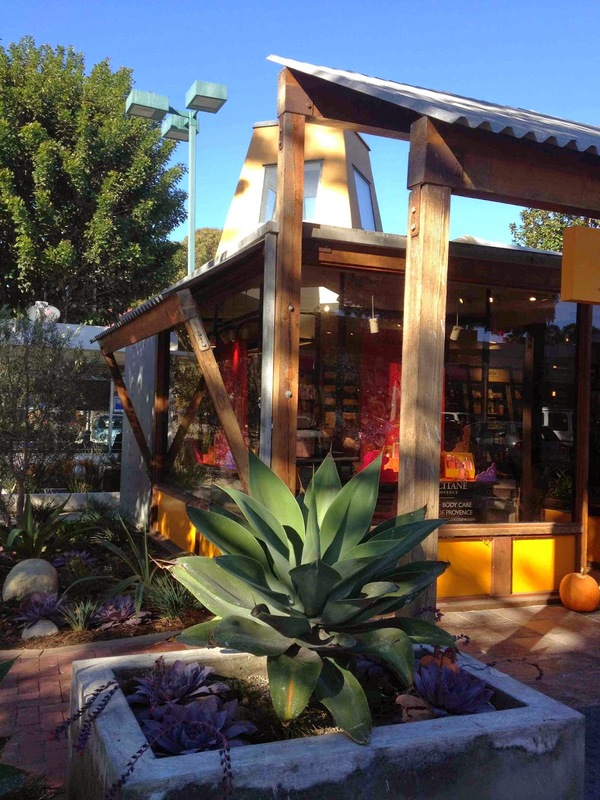 And one of my favorite spots to be inspired by great design is Malibu's quaint little village. It seems to naturally combine all of the elements I love, California country, modern meets rustic with a bit of Provence thrown in. 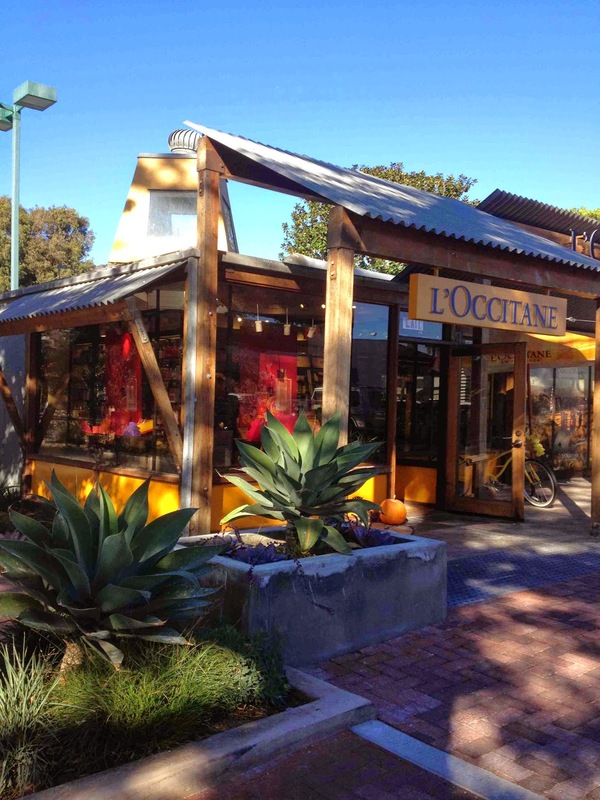 I love this L'Occitane shop design for many reasons. It's an organic blend of opposites. The rustic wood beams, corrugated metal roof and big glass windows combine natural and modern textures in an even measure so as to be inviting and well-proportioned. 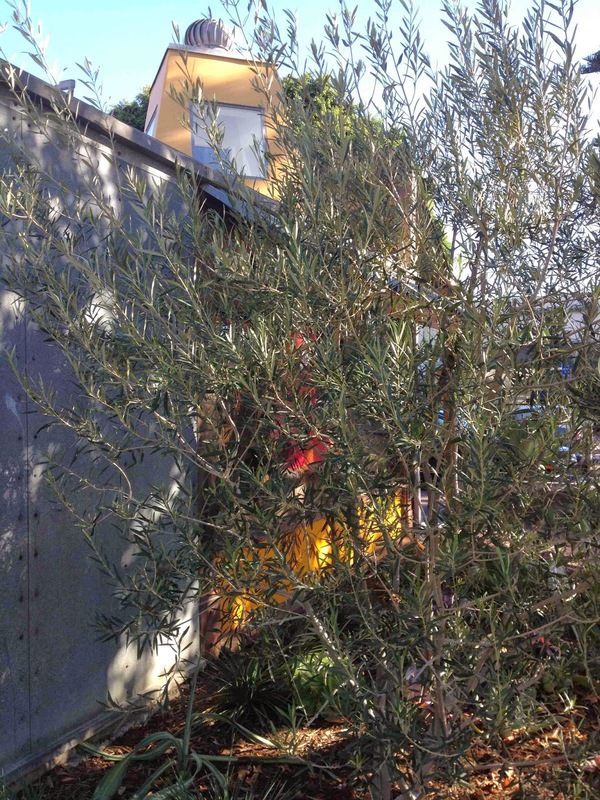 Even the cement container in front contrasts with the softer organic lines of this California-friendly drought-resistant plant. Could you imagine living in a tiny house that looked like this little boutique and being quite happy, especially if your big windows had a private view of the ocean or a forest or a garden? I could! And notice that pyramidical cupola feature on top with the square windows on each of its four sides. There is incredible nature light bouncing around the inside of this space. And what is this material: sheet metal? It looks good to me, too. 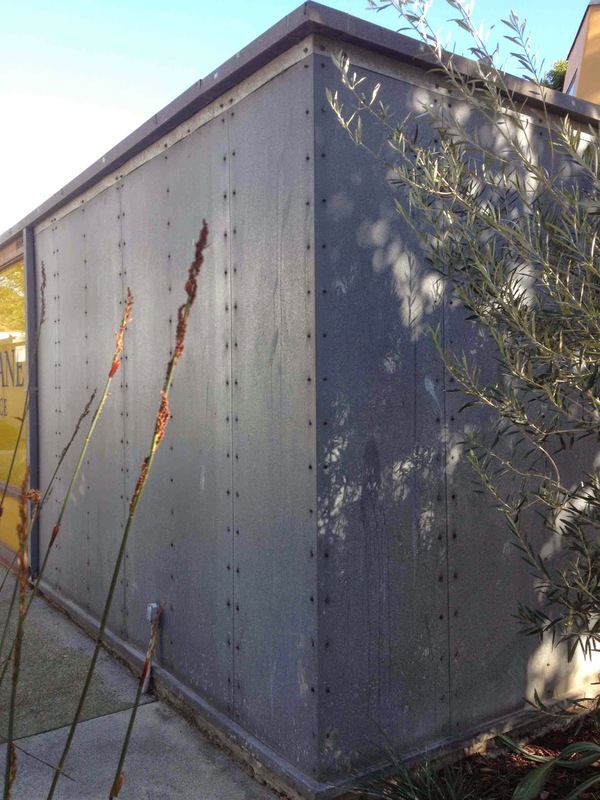 But notice the entire exterior is not all covered with metal. That would be too overbearing. 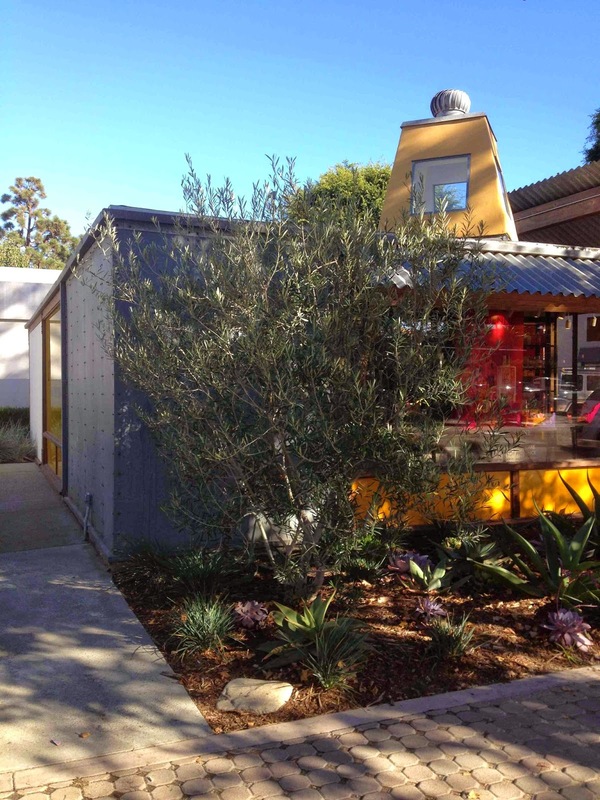 It's offset with the yellow stucco and a lot of glass. And surely, the landscaping adds interest as well. Love the olive tree. 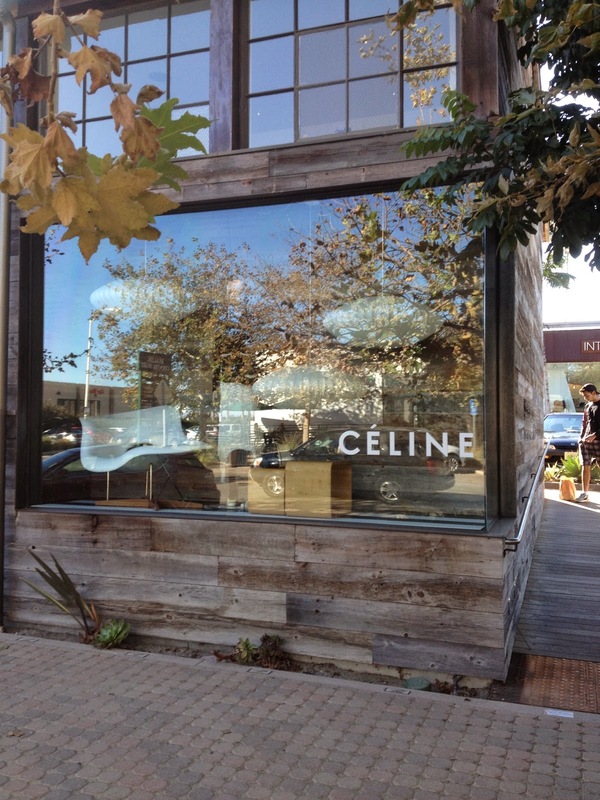 Here's another store down the street from L'Occitane called Celine. 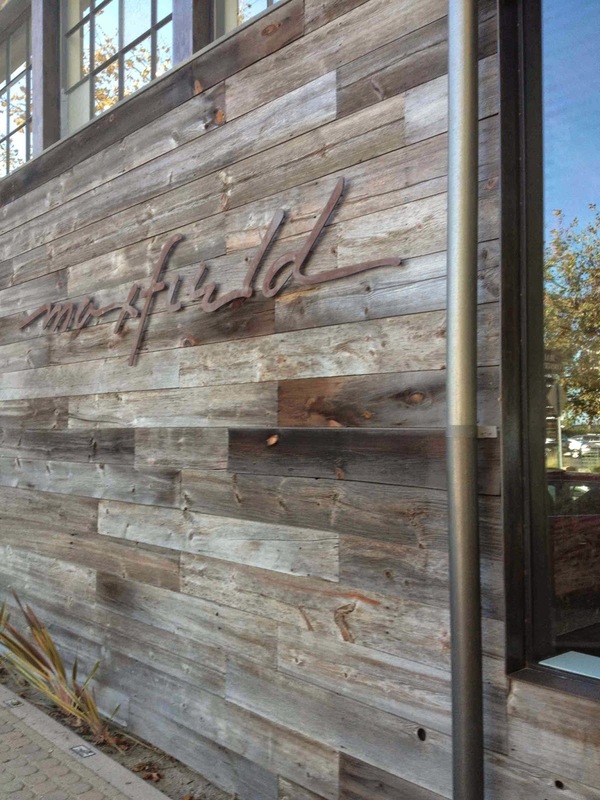 Notice how amazing reclaimed barn wood looks juxtaposed with big glass windows. I could live in this store, too. I guess as long as you keep your windows clean, the surface is so reflective that it's not that easy to see inside. Again, opposites attract: rustic barn wood paneling with a rusty metal sign and what looks like a steel drainpipe. Did the designer have a choice on whether there would be this 10-inch strip of land between the exterior of the building and the sidewalk? Maybe not. But, the addition of the succulents and native grasses softens the lines between the hard brick and wood, and is, in my opinion, a lovely place for the eye to rest. 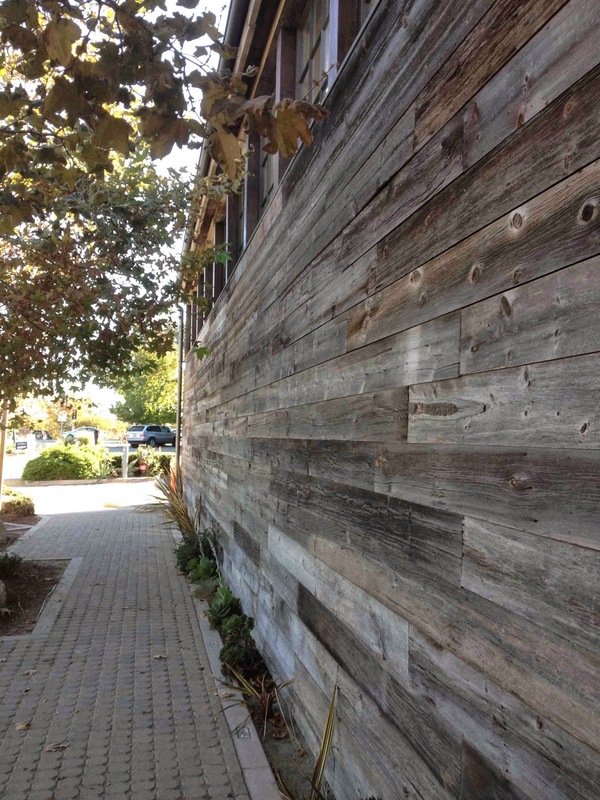 I love the leaves of the tree that overarch the sidewalk and touch the wall of the building. That's the thing about organic design. You don't really have to worry about everything matching: nature supplies the color palette. And when you make an effort to combine the basics in proper proporton: wood, metal, glass--you can't really make a mistake. Do you have a parkway in the front of your house and you're just not sure what to do with it? Perhaps some tall grasses and a few boulders at the base of a native tree would fill in that space quite nicely. Just a few more doors down I noticed this landscaping combo. 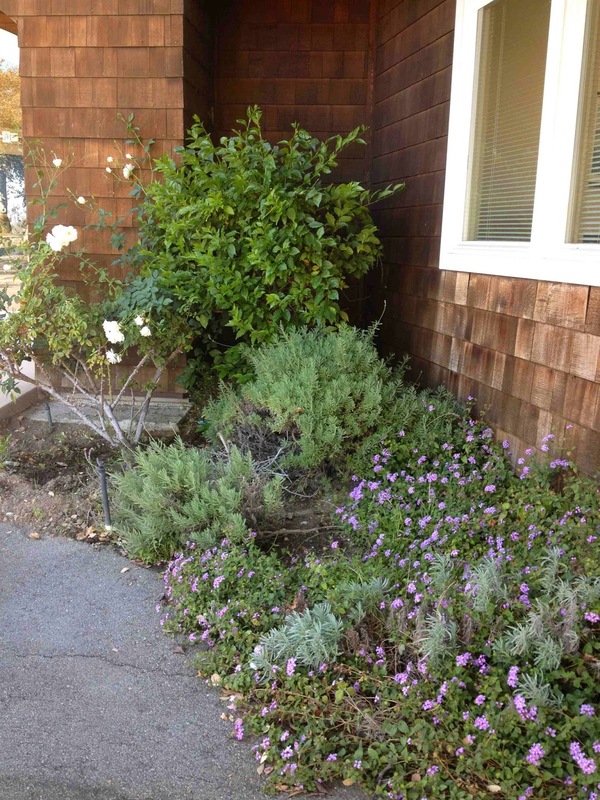 It's simple: white roses, purple lantana and what I think is lavender. 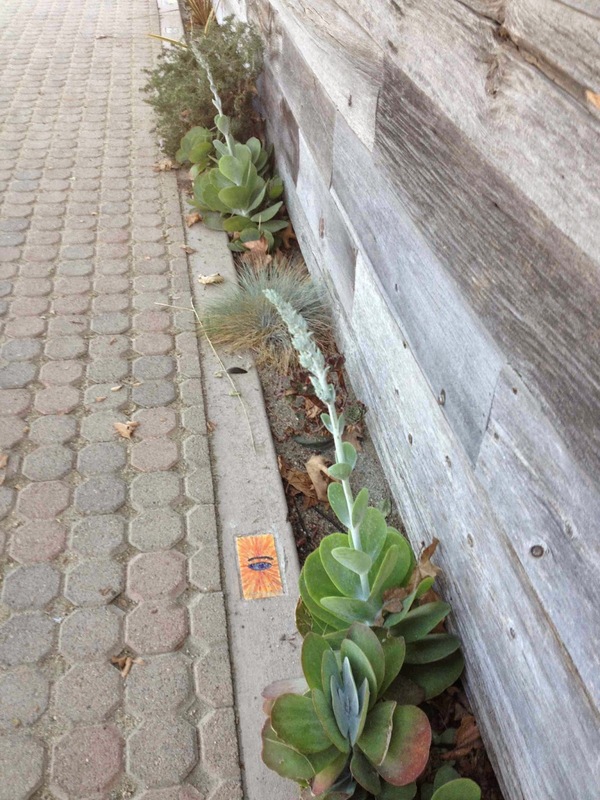 It's a smart trio of plants that could work well lining a walkway up to your front door. It just gets prettier as it grows in and fills out. 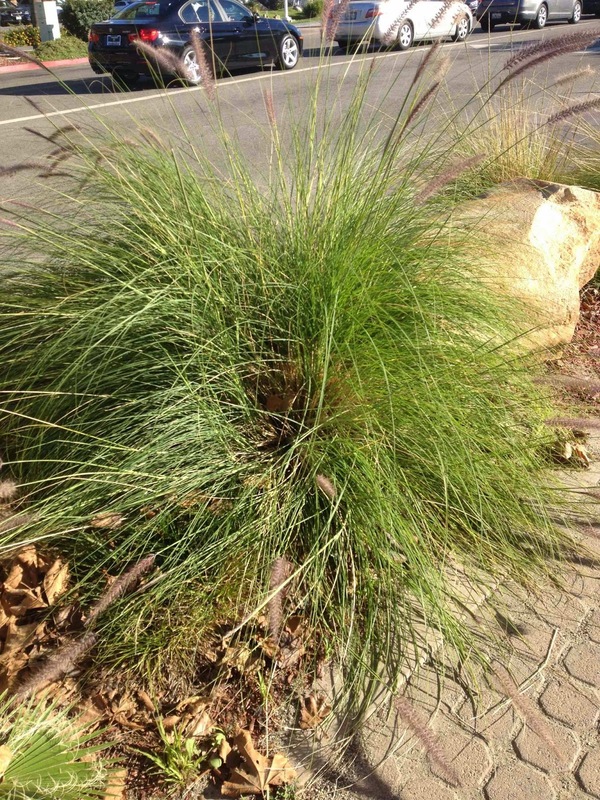 Is that purple fountain grass? 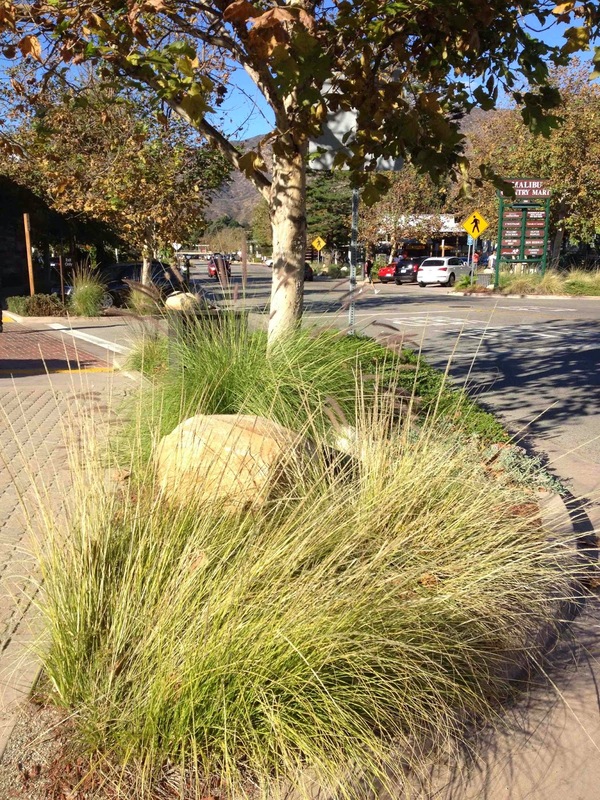 Not sure, but tall grasses and light colored boulders make a friendly landscaping team.